ECONOMIC gloom is not clouding the Christmas charity season. At least 30 outreach groups with volunteers from all walks of life are helping those less fortunate. Ms Lisa Li, 28, is an organiser of a 65-strong group distributing hampers of toiletries and biscuits, in partnership with the Kreta Ayer Residents' Committee. She and a group of friends distributed 300 gift bags for the first time last year. This year, on Dec 21, they are distributing 1,200 hampers to elderly folk living in one-room flats in the Chinatown area. The hampers, worth about $10 each, will reach those who do not receive public assistance. 'We raised funds by asking people we knew to contribute to the cause. 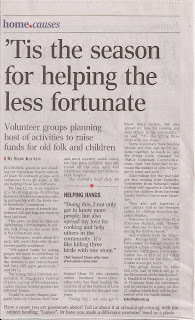 Many are affected by the downturn and retrenchment but they still gave generously,' said Ms Li. The Young Men's Christian Association of Singapore's Festival of Love, a group of 60 volunteers, makes various holiday goodies for different homes. To add to mouse-shaped pineapple tarts for Chinese New Year and most recently ondeh ondeh for Hari Raya Aidilfitri, they will round off the year with 400 Christmas cupcakes for the Dover Park Hospice. The festival's head chef, Mr Samuel Chan, 23, who operates online business www.sams-cakes.com, has been leading the creation of all the Festival of Love cooking sessions for the past two years. Some volunteers have become friends and now sign up for sessions together. So much so, said Ms Sivian Look, manager for YMCA Corporate Communications, that 'we have had to increase the number of slots for people to come and cook'. Glad tidings for the year-end are also coming from students. Volunteers from National Junior College will organise a Christmas party for children from Daybreak Family Service Centre next Saturday. They also put together a last-minute visit to the Newater centre for children from low-income families. And students from the Singapore Management University have joined the Raleigh Society to organise a fund-raising walk next Saturday. Participants pay a registration fee of $20 for the 10km route and $60 for the 50km and 100km overnight route. The group hopes to raise $80,000, half of which will go to the Movement of the Intellectually Disabled of Singapore. A group of 35 people from the movement will be invited to a party on Dec 27, during which they will be presented with the funds raised.